The visual arts program in Early Childhood is primarily exploratory in nature. Process is valued over product, and students are encouraged to utilize materials in creative ways under the guidance of teachers. The annual art show showcases student art projects, many of which are designed to enrich a particular unit of study. Students can also choose to explore the creative arts during afternoon activity time. 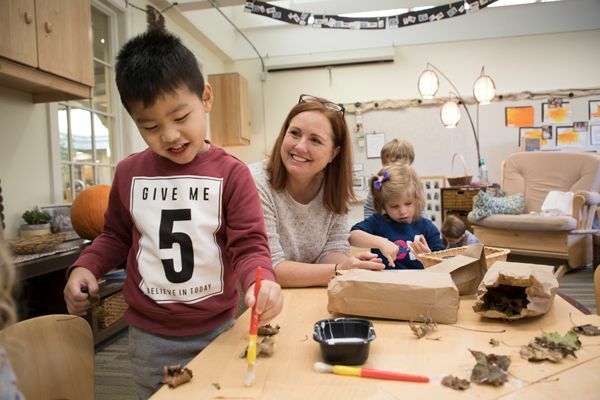 The Lower School students learn to form opinions, collaborate with peers and creatively engage with materials to create works of art through the process of exploration. This is the creative process that guides students to make informative decisions about their work while being unafraid to try new things and make mistakes. In the art classroom, mistakes are not a failure but rather an opportunity to improve. Accepting this idea is one of the purest forms of perseverance. It is our belief that when children play and explore media, plan and stretch their ideas they learn to take risks. As children acquire confidence in creative exploration, they learn about their true selves as individuals and as members of a larger community. Highlights of the program are The Evening of Art and Music, a Visiting Artist, and the 4th and 5th grade Art and Music Performance. The Middle School Art Program is composed of a number of interdisciplinary units that correlate with other classes and consider the essential question of each grade level. All units begin with an inquiry or problem and a set of guidelines for students to follow. The goals of the Middle School Art Department are to ensure that a student’s experience with art includes direct applications beyond the classroom; attends to the social and ethical dimensions of learning; emphasizes deep understanding; demands a disciplined approach to analysis and communication; balances collaborative and individual work; cultivates a sense of personal agency; leverages emerging technologies as a tool to enhance learning; and allows for the possibility of multiple solutions. Highlights of the program include Middle School Musical Set Design, An Evening of Art and Music, and the Biomimicry Art and Science Forum. Upper School arts offer a wide range of classes in both the rotation and intensive semesters. Rotation term offerings include art fundamentals, art & design principles, ceramics, digital art design, drawing & painting, media arts, photography, sculpture, and AP studio art. Intensive offerings have included drawiing & painting the figure, fashion design, filmaking, furniture building, welding and inter-disclipinary courses such as, Before the selfie, there was paint, Cameras, Computers and Cleveland and the Cleveland Mosaic project.